It will not have escaped the notice of those who follow the doings and interests of the two of us at The Old Stile Press that music is hugely important to our lives and, indeed, has often provided the starting point for our books. Peter Grimes and Abraham and Isaac are obvious examples. It is not often, however, that one of our publications comes to visit us, as it were, in quite such an exciting way as this! During this season of Welsh National Opera (undoubtedly one of Wales’ greatest treasures), you will be able to see performances, at the stunning Millennium Centre in Cardiff and later at the Birmingham Hippodrome of Bela Bartok’s Duke Bluebeard’s Castle, conducted by Carlo Rizzi. The production is in conjunction with the Royal Opera House, Covent Garden and is to be sung in Hungarian. 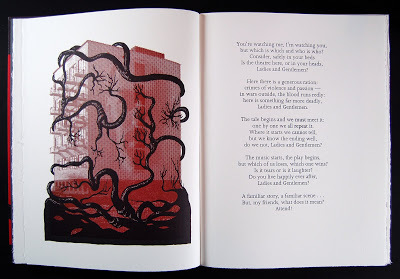 A number of years ago however, John Lloyd Davies, Head of Opera Development at the ROH, had made an English version of the libretto for performances of the opera and it is this version that we used for Susan Adams’ sensational book. 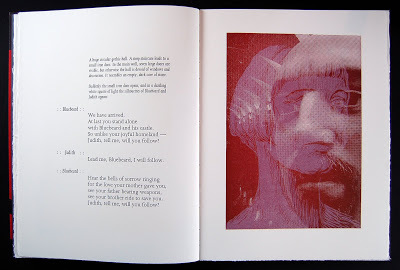 Her images, combining woodcut with computer generated imagery, make chilling scenes of the mysterious castle and its ‘prisoners’, to match the complexity of emotion and psychological shifts which are central to the opera. The story is of the young bride, Judith, brought to her new home by the Duke. She longs to fling open windows, to let sunlight flood into her castle but gradually she has to face the truth of what may have happened here – the truth of the destroyed lives of the three previous wives. 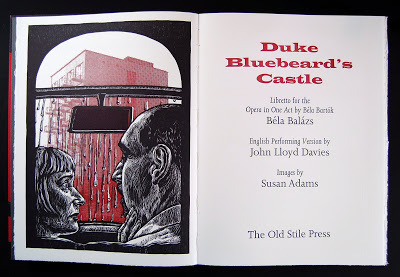 Her curiosity drives her to open the seven locked doors and it becomes clear that Bluebeard and Judith face spiritual loneliness in the face of love. The book is hardly a libretto that you might have in your pocket as you arrive at the opera house but it does match the power of one of great operas of the twentieth century and creates a ‘maze of the imagination which allow one to take on the fearful realities’. Click here to see the full description of our book. Copies of the book are here at the Press – seats at the opera house are not ours to sell but contact them if you want to see the opera.